Critter Wranglers provides nuisance animal removal services throughout Knoxville and it’s surrounding communities. Below you find great information on some of our most common critters and just what they might be up to in your yard or home. Raccoon are the official state mammal for Tennessee. They are generally nocturnal animals and will spend most daylight hours in their dens. The average size of a raccoon is 12-30 pounds and has a ringed tail and fur that is grayish sprinkled with black. Their mating season begins in February, producing 2-5 cubs or kits per litter in April or May. Why are Raccoon considered a nuisance animal? 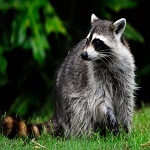 Raccoon can wreak havoc on your home and yard during the mating and rearing seasons. They will raid bird feeders, trash cans and yards for food. Once a steady food source has been found, the raccoon will likely move in for good! Female raccoon will seek out safe and warm shelter to raise their young. This may be in a backyard shed, under your house or in your attic. They will actively seek out damaged or faulty construction to gain entry into their new home. We see it every day! Already have a raccoon living in your attic or basement? Critter Wranglers can help! We can humanely trap the mother and her babies and repair any damage they may have caused. We can also help prevent raccoon from getting in your home with preventative seal ups. We can inspect your property and let you know of any areas that may become a problem later on. Give us a call if you have a raccoon problem in the greater Knoxville area! Opossum or possum are the only marsupial or pouched animal in the state of Tennessee. They are generally nocturnal but during the winter months they may forage during the day. The average size of an opossum is 9-13 pounds. They have long coarse grayish white fur and a scaly tail. Opossum have an extended breeding season from December to October and usually produce 2 litters per year, during February and June. Just one litter may have as many as 13 joeys or babies. 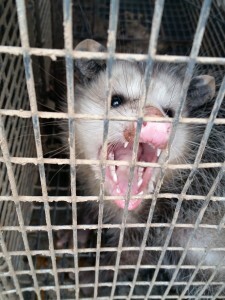 Already have an Opossum living in your crawlspace or digging in your trash can? Critter Wranglers can help! Call us if you need opossum removal in Knox County. We can humanely trap and relocate them. We can also prevent re-entry into your home by animal proofing any entry points the opossum may use. There are two main reasons people want rid of skunks, the damage done to lawns and the smell. Skunks grub at night which leaves small cone shaped holes in your yard. The more food they find the more your yard will look like a mine field! We have seen freshly sodded yards destroyed overnight by grubbing skunks and raccoon. Controlling the population around your home is the most effective way to limit the damage to your yard. If you have seen or are smelling a skunk on a regular basis, we suggest you give us a call! Critter Wranglers can help prevent a skunk and her family from taking up residence under your home or shed. We can also humanely handle your existing skunk problem and give suggestions on habit modifications to deter more skunks from trying to move back in! In Tennessee, we have two common types of squirrels, the Eastern Gray Squirrel (pictured above) and the Eastern Fox Squirrel. The Gray Squirrel is the most common and is gray with a cinnamon tone and a white underbelly. The hair is much longer on its bushy tail, which is pale gray or white. The Fox Squirrel varies greatly in color, but usually has gray and black hair on their backs with an orange belly. The orange color may extend to the feet, cheeks, around the ears, and to the edges of their tail. Squirrels typically breed twice a year, December to February and May to June. The first litter is born in February or March and the second in June or July, each containing 2-4 kits. Groundhogs, also known as woodchucks and whistle pigs, are the largest members of the squirrel family in East Tennessee. They have ever-growing incisors that must be worn down by chewing to prevent serious health issues. They are true hibernators, which means they enter their burrow in the late fall and sleep until spring. Groundhog burrows are 8 to 66 feet long and 2 to 4 feet deep and may have up to 4 entrances. The burrows and mounds of dirt left behind are not only unattractive but can be very hazardous to livestock and farm equipment. They also frequently damage vegetables, flower gardens and areas around buildings. In some cases, a groundhog can actually undermine home foundations. We most frequently find these critters under decks, sheds, barns or against building foundations. 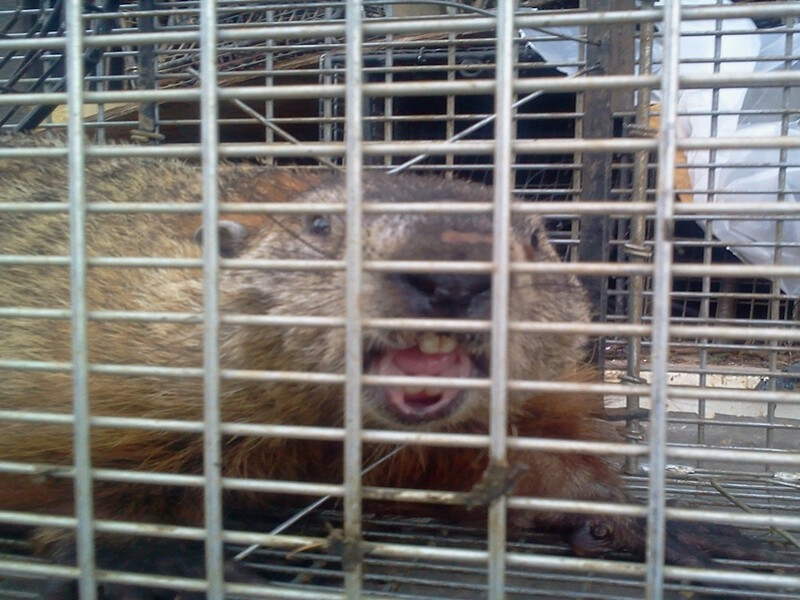 Already have a groundhog spending too much time in your yard? 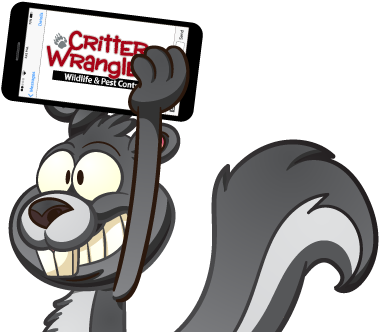 Call Critter Wranglers now before they go into hibernation or cause any more damage!